Our dinner speaker was Jim Klug of Yellow Dog Outfitters. Founder and Director of Operations for Yellow Dog Flyfishing, L.L.C., Jim has worked in the fly fishing industry as a guide, sales rep, travel coordinator, and as National Sales Manager for Scientific Anglers. He has guided extensively in Montana, Colorado, New Mexico and Oregon, and has fished throughout the world. 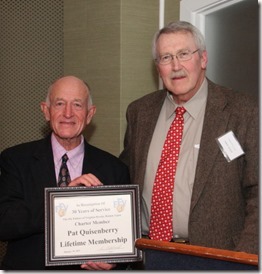 Jim spends a lot of time in the Caribbean, South America, and Alaska, working with our network of lodges and guides. Jim is the primary copywriter and photographer for the Yellow Dog catalogs and website as well as the Executive Producer for Confluence Films (the makers of DRIFT and RISE, and CONNECT). Jim’s articles and photographs have appeared in dozens of different magazines and publications, including The Drake Magazine, The New York Times, The Fly Fish Journal, Fly Fisherman Magazine, Fly Rod & Reel, Fly Fishing in Saltwaters, Fly Fusion Magazine, Caribbean Travel & Life, the L.A. Times, Fish Alaska, Voyages de Peche, and several others. 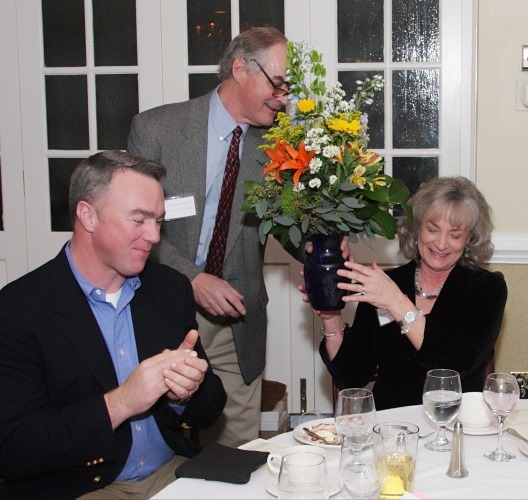 The FFV 2013 Annual Banquet was a great event! 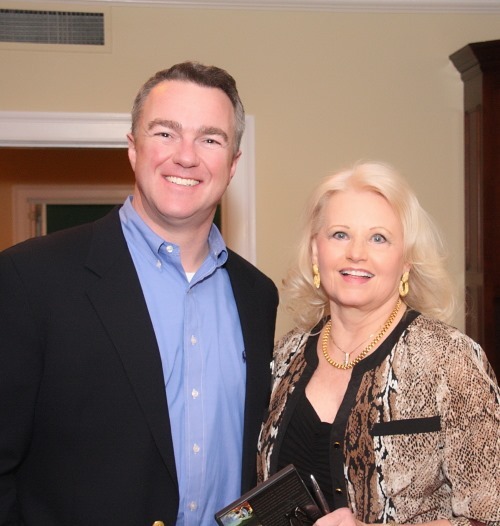 Over 130 members and their guests attended a night filled with activities. 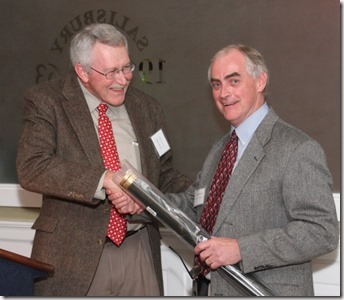 Outgoing FFV president Ken Eastwood being given a fly rod by 2013-2014 FFV president Steve Lewis. 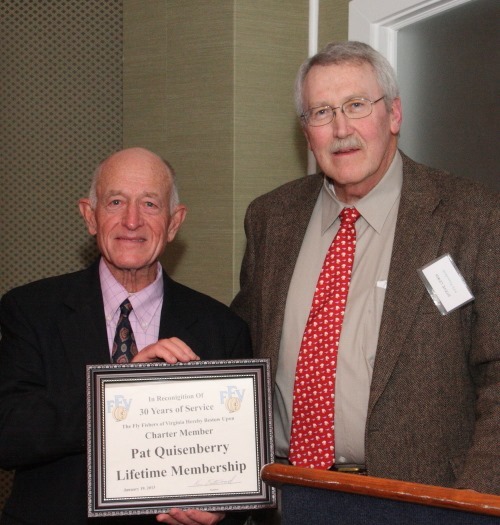 Pat Quisenberry was awarded a lifetime membership award. 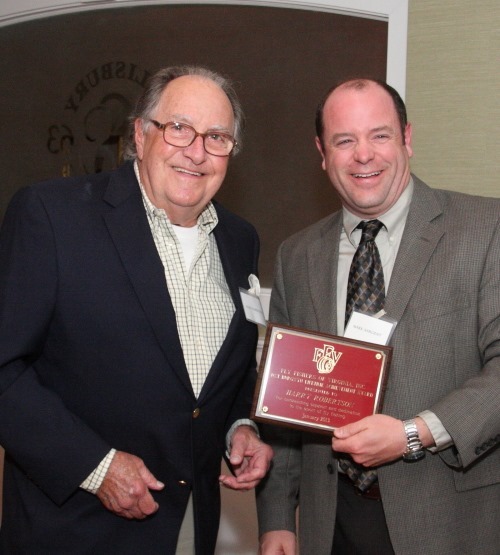 Alan Hoover (left) received two awards. The FFV Kenny Grandstaff Continuing Service award and an award from Project Healing Waters which was presented by PHW coordinator Phil Johnson (right). 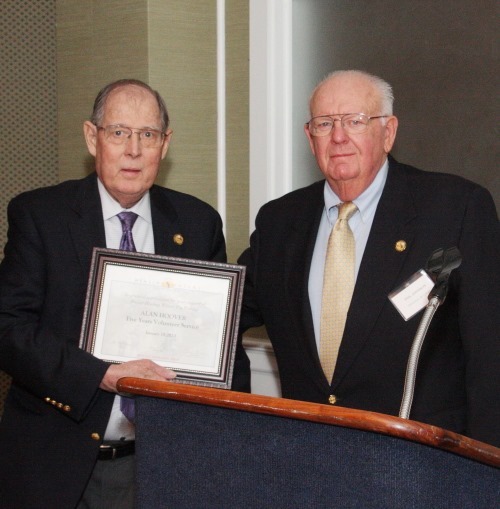 Mark Sargent (right) gives Harry Robertson the Nat Burgwyn Lifetime Achievement Award for his decades of service to the fly fishing community at large. 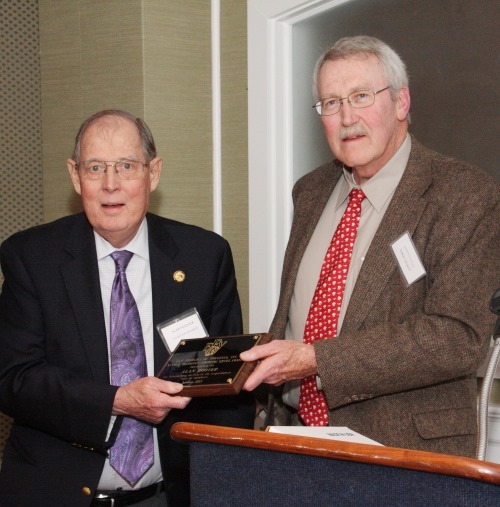 Shenandoah River Keeper, Jeff Kelbe received the FFV Taylor Turner conservation award. 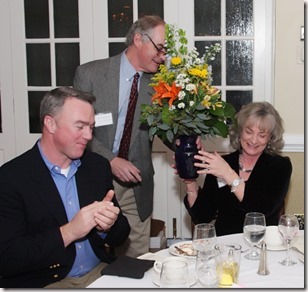 Jeff will be our dinner speaker in November, 2013. 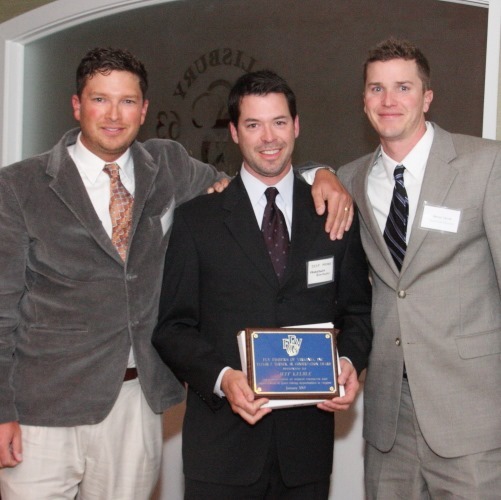 Pictured with him are Colby (left) and Brian (right) Trow of Mossy Creek Outfitters. Our 2013 Annual Banquet speaker, Jim Klug, pictured with FFV Treasurer JoAnn Lindstrom-Clark. 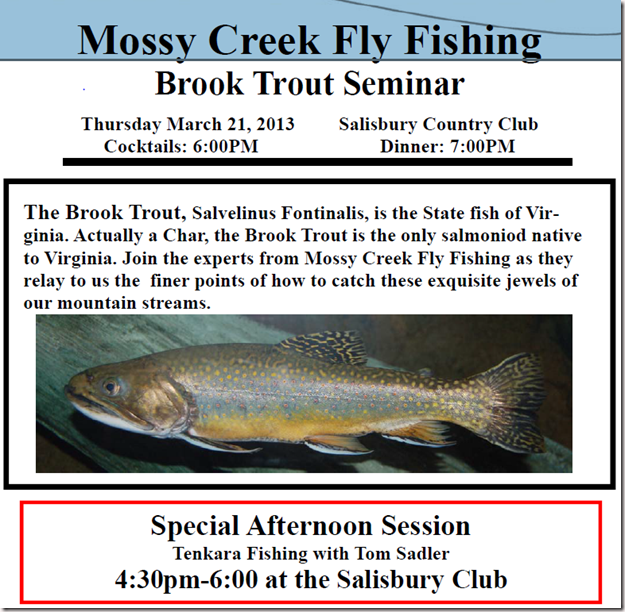 If you attended our March, 2012 Smallmouth Bass Symposium you won’t want to miss our March, 2013 Trout Fishing Seminar. 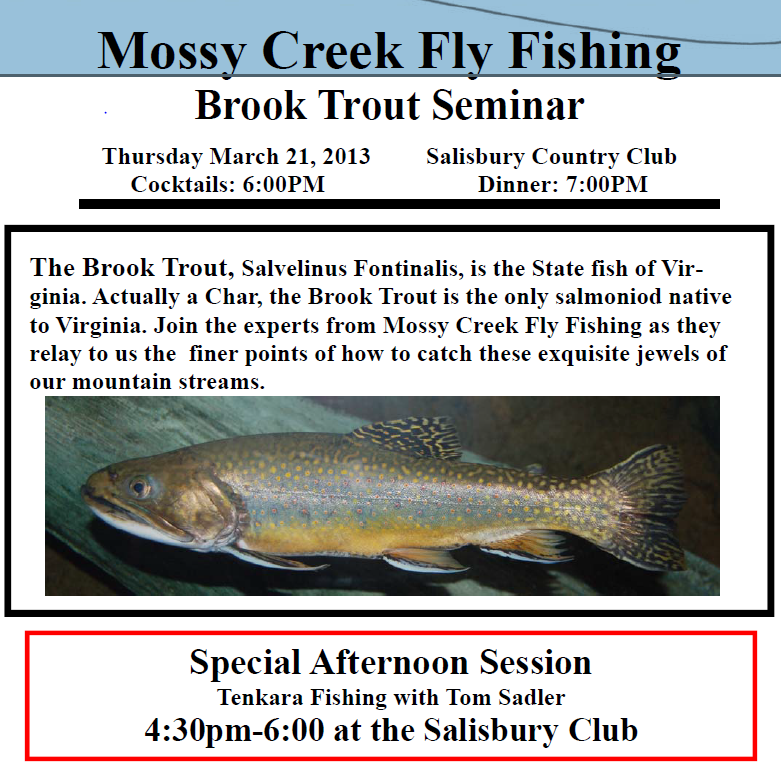 Colby and Brian Trow of Mossy Creek Fly Fishing will be at the March FFV Dinner meeting and will have several other fishing guides with them for a discussion about trout fishing in Virginia. The May Meeting will be on May 23rd. This is one week later than usual! Here is the May, 2013 Singing Reel newsletter. 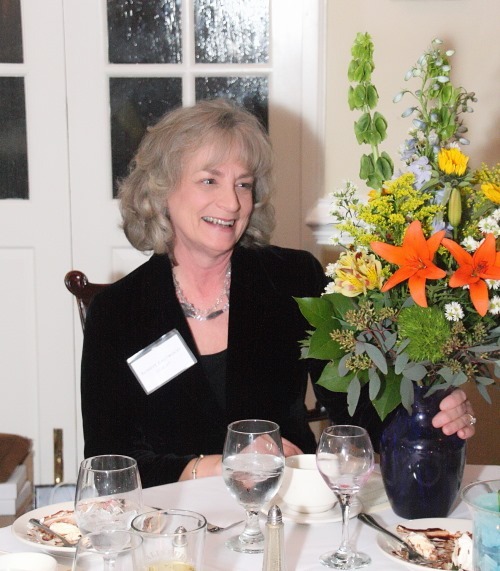 You don’t want to miss our July Dinner meeting! Paul’s evening dinner presentation will focus on ‘Carp on the fly’. We have not had Carp as a topic for a dinner meeting in the past so this should be very interesting and informative. 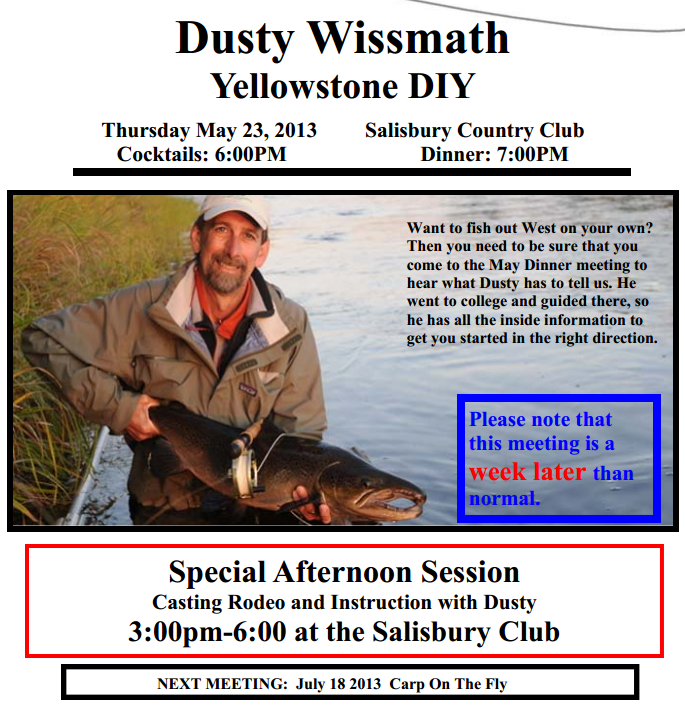 Paul will also hold an afternoon session on ‘fly fishing for redfish’. My name is Paul Rose, licensed fishing guide and USCG Captain. 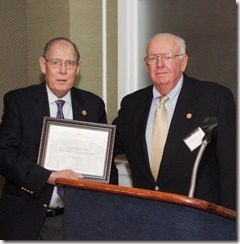 I am a proud ,active member of both CCA and FFF. 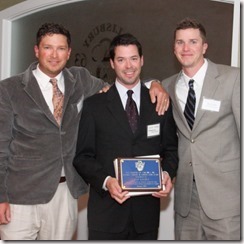 Flyfishing for more than 25 years, my experience started in western PA fishing rivers and streams for trout and bass. As a Pittsburgh native it is OK to associate me with Steeler football, Mario Lemieux and a Permanti’s sandwich. After my anesthesia training (pays the bills, refer to children below), I relocated to Austin, TX and became a longhorn fan and a saltwater junkie on the famed TX coast. Starting out with a tunnel jon boat with the highest platform you ever saw, I learned to saltwater flyfish. The passion still burns bright as ever, but the boat has been upgraded a bit to Hells Bay Waterman. Three children later (all girls and all can flyfish), I moved back east to Charlotte, NC to be closer to family and friends. Four years ago I decided to combine all of my experiences with some new ones from the Carolinas to create a quality guide service. This service is dedicated to teaching and to customer service. That’s a guarantee along with hard fishing and hard guiding. In fact I never even wear a watch on the water. When you’re satisfied we can go home. While the service offers a variety of trips, I am a warm water specialist particularly enjoying carp and bass on the fly, not to mention trout and redfish. Here is the July, 2013 Dinner Menu and reservation form. We must receive your reservation and check by Tuesday, July 16, 2013 to insure that you have a reservation. Here is the July, 2013 Singing Reel Newsletter. Our September 19th FFV Dinner speaker will be Captain Jeff Lewatowski. Jeff has over 11 years of guiding experience on waters all over the United States. 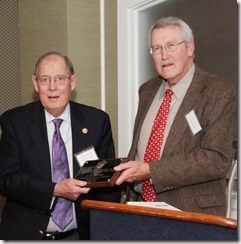 Much of his time is spent fishing in and along the Chesapeake Bay and tributaries in Maryland. He also fishes Maryland’s coastal and inshore Atlantic waters out of Ocean City, and runs some excellent guided and instructional stream trips for trout along the beautiful Gunpowder River and other Maryland streams. His afternoon session will focus on fishing the Susquehanna river’s ‘Flats’ section and the evening dinner presentation will be on fishing the Gunpowder river in Maryland. Here is the September 2013 Singing Reel newsletter! Potomac Riverkeeper, Inc. is home to two Riverkeeper programs:one for the Potomac River and one for the Shenandoah River. and enforcement to protect and restore water quality in the Shenandoah Valley for people, fish, and aquatic life. ruined his fishing guide business, Jeff closed his 6-year old business and joined up with Potomac Riverkeeper Ed Merrifield. the Resource Conservation and Recovery Act, and other environmental laws. Contact Jeff to learn more!